Jidaigeki (時代劇; lit. "era drama") is a genre of film, television, video game, and theatre in Japan. Literally "period dramas", they are most often set during the Edo period of Japanese history, from 1603 to 1868. Some, however, are set much earlier—Portrait of Hell, for example, is set during the late Heian period—and the early Meiji era is also a popular setting. Jidaigeki show the lives of the samurai, farmers, craftsmen, and merchants of their time. Jidaigeki films are sometimes referred to as chambara movies, a word meaning "sword fight", though chambara is more accurately a subgenre of jidaigeki. Jidaigeki rely on an established set of dramatic conventions including the use of makeup, language, catchphrases, and plotlines. Many jidaigeki take place in Edo, the military capital. Others show the adventures of people wandering from place to place. The long-running television series Zenigata Heiji and Abarenbō Shōgun typify the Edo jidaigeki. 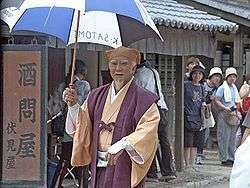 Mito Kōmon, the fictitious story of the travels of the historical daimyo Tokugawa Mitsukuni, and the Zatoichi movies and television series, exemplify the traveling style. Another way to categorize jidaigeki is according to the social status of the principal characters. The title character of Abarenbō Shogun is Tokugawa Yoshimune, the eighth Tokugawa shogun. The head of the samurai class, Yoshimune assumes the disguise of a low-ranking hatamoto, a samurai in the service of the shogun. Similarly, Mito Kōmon is the retired vice-shogun, masquerading as a merchant. In contrast, the coin-throwing Heiji of Zenigata Heiji is a commoner, working for the police, while Ichi (the title character of Zatoichi), a blind masseur, is an outcast, as were many disabled people in that era. In fact, masseurs, who typically were at the bottom of the professional food chain, was one of the few vocational positions available to the blind in that era. Gokenin Zankurō is a samurai but, due to his low rank and income, he has to work extra jobs that higher-ranking samurai were unaccustomed to doing. Sengoku-jidai (Warring States era setting) is a Japanese genre that has been used as the setting for novels, films, video games, anime and manga. It bears some parallels with the Western; Akira Kurosawa's Seven Samurai, for example, was remade in a Western setting as The Magnificent Seven. The warrior class included samurai, hereditary members in the military service of a daimyo or the shogun (themselves samurai). Ronin, samurai without masters, were also warriors, and like samurai, wore two swords; they were, however, without inherited employment or status. Bugeisha were men, or in some stories women, who aimed to perfect their martial arts, often by traveling throughout the country. Ninja were the secret service, specializing in stealth, the use of disguises, explosives, and concealed weapons. A separate police force handled matters involving samurai. The ōmetsuke were high-ranking officials in the shogunate; the metsuke and kachi-metsuke, lower-ranking police who could detain samurai. Yet another police force investigated arson-robberies, while Shinto shrines and Buddhist temples fell under the control of another authority. 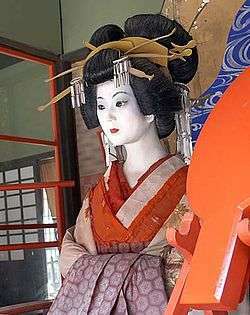 The feudal nature of Japan made these matters delicate, and jurisdictional disputes are common in jidaigeki. Edo had three fire departments. The daimyo-bikeshi were in the service of designated daimyo; the jōbikeshi reported to the shogunate; while the machi-bikeshi, beginning under Yoshimune, were commoners under the administration of the machibugyō. Thus, even the fire companies have turf wars in the jidaigeki. 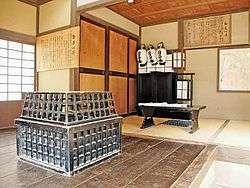 Each daimyo maintained a residence in Edo, where he lived during sankin kotai. His wife and children remained there even while he was away from Edo, and the ladies-in-waiting often feature prominently in jidaigeki. A high-ranking samurai, the Edo-garō, oversaw the affairs in the daimyo's absence. In addition to a staff of samurai, the household included ashigaru (lightly armed warrior-servants) and chūgen and yakko (servants often portrayed as flamboyant and crooked). Many daimyo employed doctors, goten'i; their counterpart in the shogun's household was the okuishi. Count on them to provide the poisons that kill and the potions that heal. In long-running TV series, like Mito Kōmon and Zenigata Heiji, the lead and supporting actors sometimes change. This is done without any rationale for the change of appearance. The new actor simply appears in the place of the old one and the stories continue. This is similar to the James Bond film series or superhero films, in contrast with e.g. the British television program Doctor Who. In chambara films, the violence is generally considerably stylized, sometimes to such a degree that sword cuts cause geysers of blood from wounds (though severing arteries will in fact cause just that, and light razor-sharp long swords like katanas are best suited for styles that target weak points with fast, shallow slashes). Dismemberment and decapitation are common, too, though this would in fact tend to break traditional Japanese blades, which were not meant to chop through bone. In addition, the authors of series invent their own catchphrases called kimarizerifu that the protagonist says at the same point in nearly every episode. In Mito Kōmon, in which the eponymous character disguises himself as a commoner, in the final sword fight, a sidekick invariably holds up an accessory bearing the shogunal crest and shouts, Hikae! Kono mondokoro ga me ni hairanu ka? : "Back! Can you not see this emblem? ", revealing the identity of the hitherto unsuspected old man with a goatee beard. The villains then instantly surrender and beg forgiveness. Likewise, Tōyama no Kin-san bares his tattooed shoulder and snarls, Kono sakurafubuki o miwasureta to iwasane zo! : "I won't let you say you forgot this cherry-blossom blizzard!" After sentencing the criminals, he proclaims, Kore nite ikken rakuchaku: "Case closed." The kimarizerifu betrays the close connection between the jidaigeki and the comic-book superhero. For other works set in (or largely in) the Edo period, see Edo period in popular culture. Downtown Special: Kunio-kun no Jidaigeki dayo Zen'in Shūgō—sequel to Downtown Nekketsu Monogatari (River City Ransom in America) set in feudal Japan. Star Wars creator George Lucas has admitted to being inspired significantly by the period works of Akira Kurosawa, and many thematic elements found in Star Wars bear the influence of Chanbara filmmaking. In an interview, Lucas has specifically cited the fact that he became acquainted with the term jidaigeki while in Japan, and it is widely assumed that he took inspiration for the term Jedi from this. ↑ Duggan, Jedi M. "History of the Jedi & The Jedi Religion". Jedi Sanctuary. Archived from the original on 2007-06-30. Retrieved 2007-07-19. ↑ "Trivia for Star Wars (1977)". Internet Movie Database. Retrieved 2007-07-19. A Man, a Blade, an Empty Road: Postwar Samurai Film to 1970 by Allen White, this article discusses specific chanbara films, their distinction from regular jidai-geki, and the evolution of the genre.